Its My Life...: Pink Floyd Still Rocks! So much time passed since last time I wrote here and now I feel obligated to write a short update. The project I've been involved in UK is (finally) over, so I have spend 2 weeks in Israel working on another projects. But the real news are that I'm on vacation in US. A week ago, We landed in New York to celebrate my uncle's 50Th birthday. All family from all over the world was there (http://picasaweb.google.com/john.markh/11112006BorisBirthdayParty). Also, we have meet some friends there and had a really nice time in New York's sights (http://picasaweb.google.com/john.markh/11112006NewYork). After 3 days in NY, we flew to Miami. 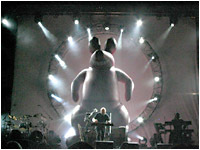 Here we went to Australian Pink Floyd show. It was AWESOME! This music is still rock! These guys made an exact replica of "Eclipse" (I think) show and I couldn't tell the difference. There was so much energy in the music that the crowd went crazy (me too)! This was definitely worth 3 hours of time and 40 dollars! Today, we are leaving on a cruise to Bahamas for 3 days, so I will keep you updated later on.